America's only female swordfish boat captain returns with this long- awaited follow-up to the bestselling The Hungry Ocean. After the exploits recounted in The Perfect Storm and The Hungry Ocean that made her a sensation, Linda Greenlaw took a ten- year hiatus from blue-water fishing. When an old friend offered her a captaincy on his swordboat, Greenlaw ditched her mounting bills and headed for the sea. Full of adventure and thought-provoking reflection, Seaworthy recounts her return to the beautiful and deadly Grand Banks -from the nuances of reading weather and the complexities of longline fishing to the surprise of landing in jail for crossing into Canadian waters. The result is both a wild ride and a memorable look at one woman's struggle to define her own limits. 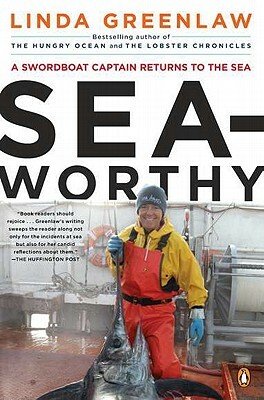 Linda Greenlaw, America’s only female swordfish boat captain, was featured in the book and film The Perfect Storm. She has written three New York Times bestselling nonfiction books about life as a commercial fisherman as well as a cookbook and two mysteries. She lives on Isle au Haut, off the coast of Maine.